It Couldn’t Be Any Plainer……. – The Tundra Tabloids……. It Couldn’t Be Any Plainer……. As PMW reported last week Mahmoud Abbas continued the PA practice of saying in English what Western leaders want to hear while giving his people a diametrically opposed message in Arabic. In this most recent case, which should have important repercussions for future US – PA relations, Mahmoud Abbas told Condoleeza Rice and the Arab world on Al-Arabiya satellite TV, contradictory messages about the essence of the conflict. 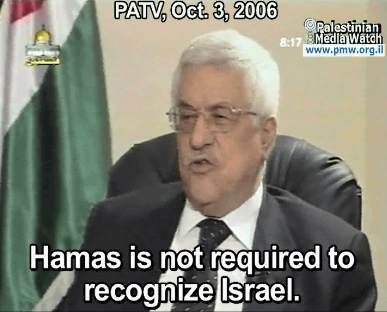 He told Rice that he demands that Hamas recognize Israel, only a day after telling the Arab world that not only doesn’t Hamas have to recognize Israel but even Fatah, which he heads, is not required to recognize Israel. However he does demand that Hamas ministers and Fatah ministers of a future government recognize the existence of their Israeli counterparts. PMW released this report on Oct 5 2006 without the video. Previous Post Previous Post Palestinian Islamists Rob The Cradle……. Next Post Next Post Islamist/Islamic Scholar; Tariq Ramadan Exposed……!